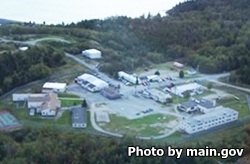 Downeast Correctional Facility is located in Machiasport Maine. It is a minimum security institution that houses over 148 adult males. The location of the prison is at the former Bucks Harbor Air Force Base which was converted to a prison in 1985. When inmates are first sent to the prison they are received by the Classification Committee which evaluates the inmate and decides which housing unit and treatment programs the offender should participate in. Substance abuse counseling is done in both a group and individual setting. Inmates also have access to educational programs where they can earn a GED and take courses through NovaNET to obtain an education equal to grades 6-12. Vocational programs include upholstery, welding, and various building/construction disciplines. All visits are by appointment only, you will need to contact the prison at the telephone number provided for more information and to setup an appointment.